Getting children out walking from an early age is so important – not just for their health as kids, but hopefully exposure to the countryside as nippers will engrain into their psyche for rest of their lives. But that hasn’t always been very easy, what with games consoles, music players and television all pulling children back into the house. However, over the past couple of years, kit manufacturers have been steadily bringing out proper walking gear for children. And I don’t mean just making some cheap tat and painting it blue or pink – I’m talking proper stuff; stuff that’s like grown-ups would have – but shrunk. Brasher’s Tora GTX walking boots are just the sort of thing I’m talking about. I mean, who have thought a Gore-Tex lined upper in a kids boot? These are real walking boots, with the same technology in them as many adult boots. And that seems to be the idea here. Make a boot for children like adult boots. Take the styling – it’s not that far removed from Brasher’s Kiso GTX Men’s Boot. The Tora GTX does have a more walking trainer style, but the boot shape helps to finish it off. The laces are tough, although the classic and familiar walking boot lacing-up system can be a bit daunting for even children who have mastered shoes. And these will last a lot longer than your young ones’ school shoes too, with the upper produce from abrasion resistant suede. The outsole is a tough affair and makes these boots perfect for even the most challenging ascents most of the young wearers will be attempting. The stiffness is about right, and the tread inspires confidence. I liked the support given to the ankle by the Tora GTX – but that protecting might take some getting used to by your young one if they’ve only been used to low-level trainers and shoes. 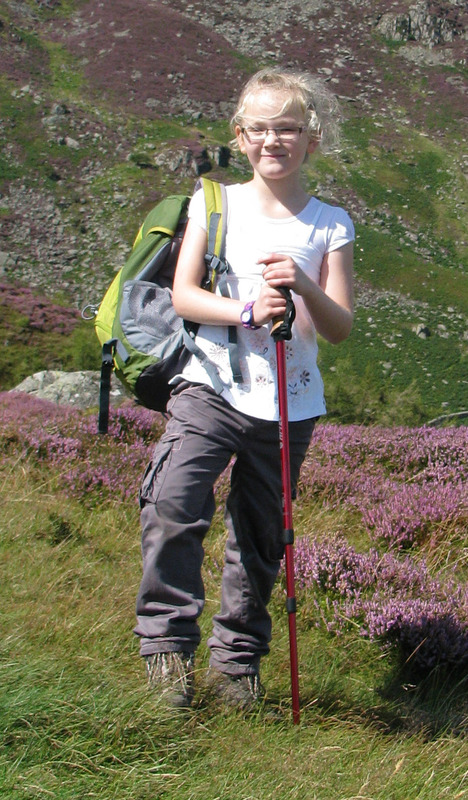 They could find it quite enclosing and restrictive – which is a problem for all children’s walking boots. However, Brasher have added a fairly padded collar to help alleviate this. The midsole has a good level of absorption, and the tester - my eldest daughter Alannah – reported she found them to be very comfortable even on difficult terrain. It seems like Brasher’s traditional rubber sole – so that’s why. If you are going to be climbing up a steep mountain or walking down a bendy path, you need excellent walkingboots. I recommend these boots because they are comfortable, have good grips and are water proof. The boots give you good heel support which helps to stop your heels hurting while you are walking. My feet felt very comfy because inside the boots were quite springy. They are waterproof too. When I was going up Mam Tor, I trod in a big puddle with just my wellies on and got my feet extremely wet. But when I went up Glenridding Dodd me and my dad had to go through a muddy marsh and my feet were as dry as can be. The only thing I could find that was wrong with the boots is the laces. They are a bit difficult for me to tie up and my Dad has to tie them up for me. I don't like the fact that some other brands make the children's boots look silly and not like proper walking boots so I would definitely recommend these boots. So, in conclusion then, another smashing boot from Brasher which just happen to be for kids. And that’s the way to look at them really - adult boots for children. If you’re looking for the perfect way to get your children out hill-walking, then a pair of Tora GTXs would certainly help do the trick – and they’d be keeping your young ones feet dry and comfortable for the entire walk. For kid's who are adventurous, this shoes will suit them. Even if this can be a little pricey, it'll be all worth it with the experiences your children gained.